The US envoy for North Korea held the second day of talks in Pyongyang on Thursday to finalize details of a summit between US President Donald Trump and North Korean leader Kim Jong-un, scheduled to take place in three weeks. 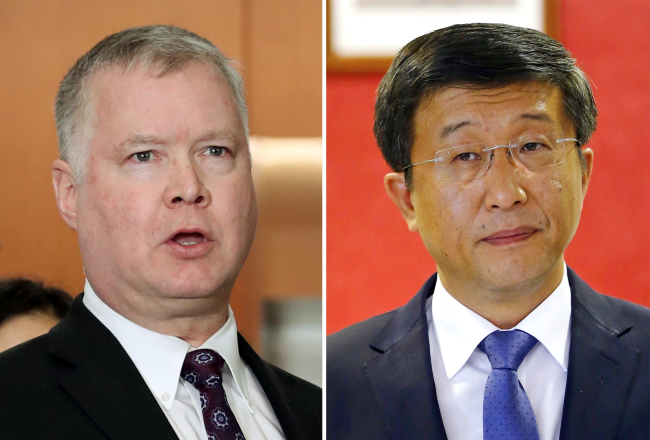 US Special Representative for North Korea Stephen Biegun continued working-level negotiations with his North Korean counterpart, Kim Hyok-chol, after arriving in the North Korean capital on Wednesday morning via plane from the US air base in Osan, Gyeonggi Province. Before flying to Pyongyang, Biegun was in Seoul for three days from Feb. 3 during which he held a series of meetings with top South Korean envoys, including Chung Eui-yong, the presidential national security adviser, to discuss North Korea’s denuclearization. Some 20 US government officials, including those from the White House, the Department of State, the Department of Defense and the Secret Service, accompanied Biegun to Pyongyang, according to sources. The two sides are expected to coordinate the agenda for the summit to be held in Vietnam on Feb. 27 and 28 and to draft a joint declaration as well as discuss safety and protocol. The changes in representatives on both sides for the working-level negotiations -- with Biegun and Kim, a former ambassador to Spain, in charge now -- are a positive sign that the talks may yield results, said Cheong Seong-Chang, a senior researcher at the Sejong Institute. “They are expected to be able to find common ground between North Korea’s denuclearization measures and US countermeasures in the US-North Korea working-level talks as Kim, who is known to be more flexible than previous negotiators, partners with Biegun, who has been given substantial authority by US Secretary of State Mike Pompeo,” he said. Pyongyang is believed to be offering to dismantle its Yongbyon nuclear complex, including uranium enrichment facilities, in return for reciprocal measures from the US, such as suspending some sanctions, agreeing to issue a joint declaration to end the Korean War, opening a liaison office and humanitarian food aid. On Feb. 1, Biegun said the US was prepared to discuss “many actions that could help build trust between our two countries,” in a speech at Stanford University in California. Noting the North Korean leader’s commitment to “the dismantlement and destruction” of North Korean plutonium and uranium sites, the US envoy stressed the need for an agreement on expert access and monitoring mechanisms for key sites in accordance with international standards. Sources familiar with the matter said Biegun will return to Seoul as soon as he wraps up his Pyongyang visit and share the results of the negotiations with Foreign Ministry officials. Meanwhile, US Secretary of State Mike Pompeo said Wednesday that he believes North Korea will be denuclearized and that Kim will keep the pledges he made at the first summit with Trump in June in order to advance the country’s economy. “I think there’s every opportunity that Chairman Kim will move on to fulfill the commitments that he made and then we’ll, in return, fulfill the commitments we made towards stability on the peninsula and a better future, a brighter future for the North Korean people,” he said. In June last year, Kim and Trump held a historic summit in Singapore, where they signed a pledge to denuclearize the Korean Peninsula, but the lack of specific details has invited criticism. Meanwhile, North Korea did not conduct any missile or nuclear tests in 2018.